I am happy to announce that I now offer gluten free cookies. I have separate utensils, mixing bowls, cookie sheets and cookie cutters that are dedicated and used only for the gluten free sugar cookies. I take every precaution to prevent cross-contamination. Please note that all cookies are made in a kitchen that uses wheat, egg, butter and tree nuts. I am happy to announce that I now offer gluten free cookies. I have separate utensils, mixing bowls, cookie sheets and cookie cutters that are dedicated and used only for the gluten free sugar cookies. I take every precaution to prevent cross-contamination. Please note that all cookies are made in a kitchen that uses wheat, egg, butter and tree nuts. 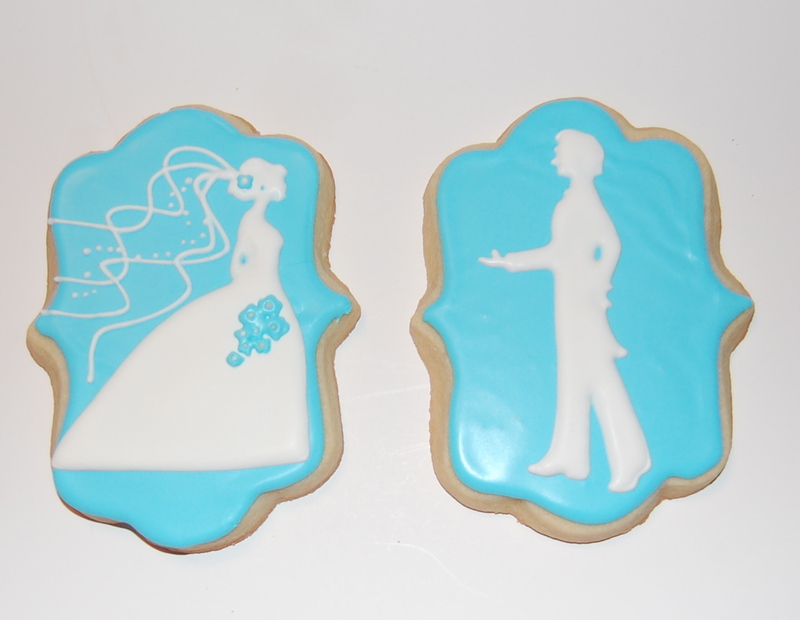 Here are some sugar cookies I made for a wedding. They were presented to the bride and groom at the wedding reception. 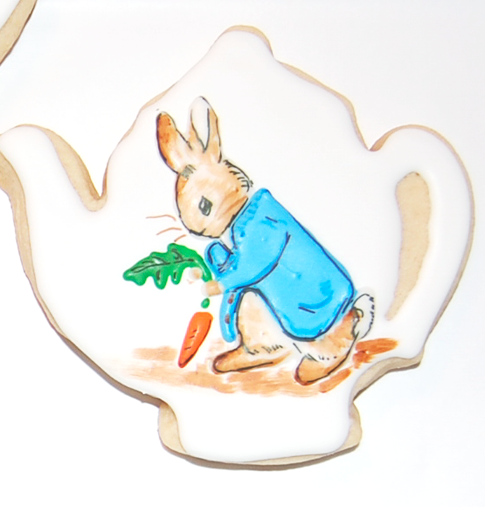 These Peter Rabbit sugar cookies were made for a baby shower. 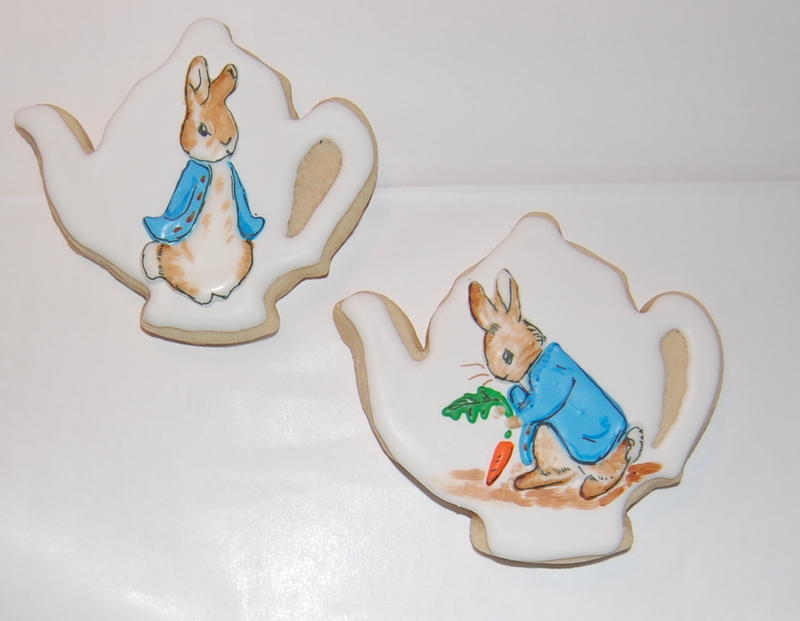 The baby shower was a tea party so I decided to put the Peter Rabbit design on a sugar cookie tea-pot. I put on my artist cap and tried my hand at painting the cookie to make it look like the pictures in the Peter Rabbit book. 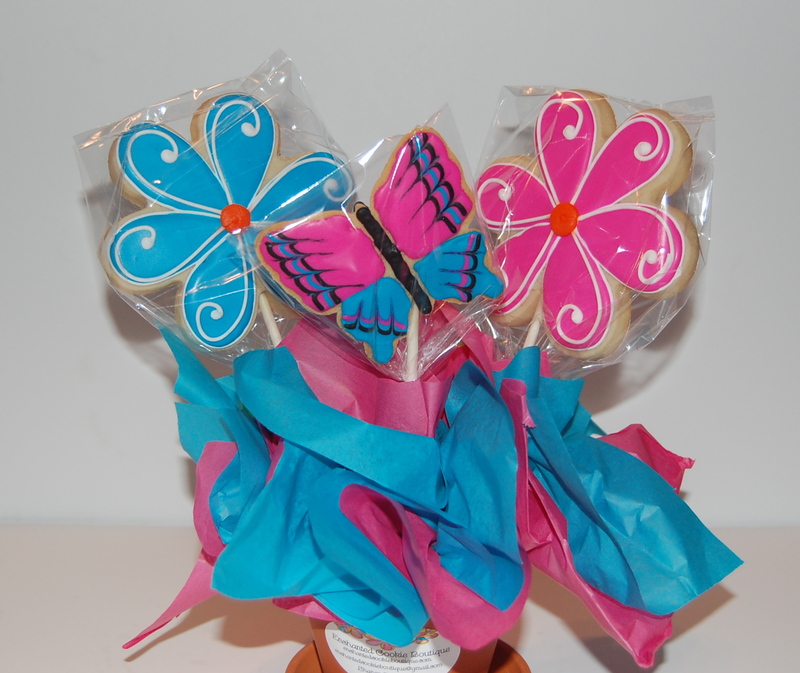 I was asked to do some small sugar cookie bouquets as table center pieces for a luncheon. I was going to put only 3 sugar cookies in each sugar cookie bouquet. Because there were only going to be 3 sugar cookies in each sugar cookie bouquet center piece I decided to try something new – a double-sided sugar cookie. For each sugar cookie I decorated both sides of the cookie. I didn’t want people on one side of the table looking at the undecorated backside of a sugar cookie. 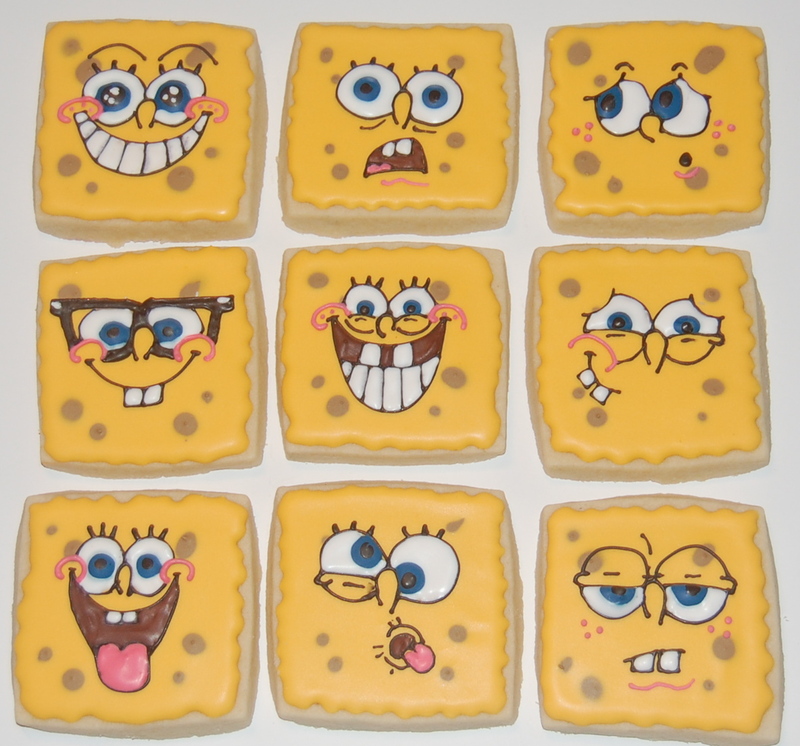 I had a lot of fun doing these Spongebob Squarepants sugar cookies. These were for a friend’s granddaughter’s birthday. 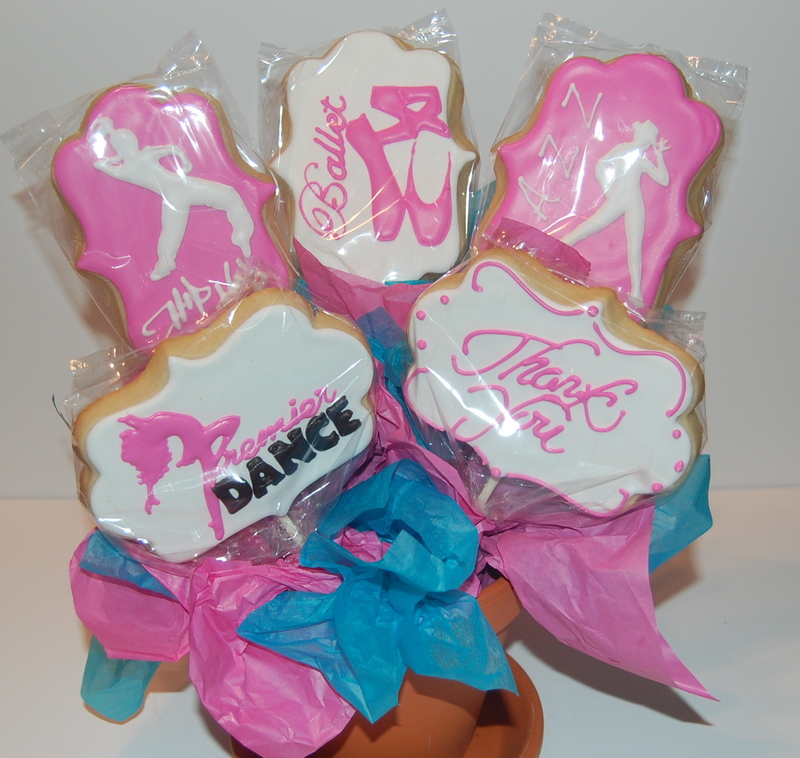 I did this sugar cookie bouquet for a teacher at a dance studio. I did a sugar cookie bouquet for the same teacher last year so I needed to do something completely different from what I did last year. 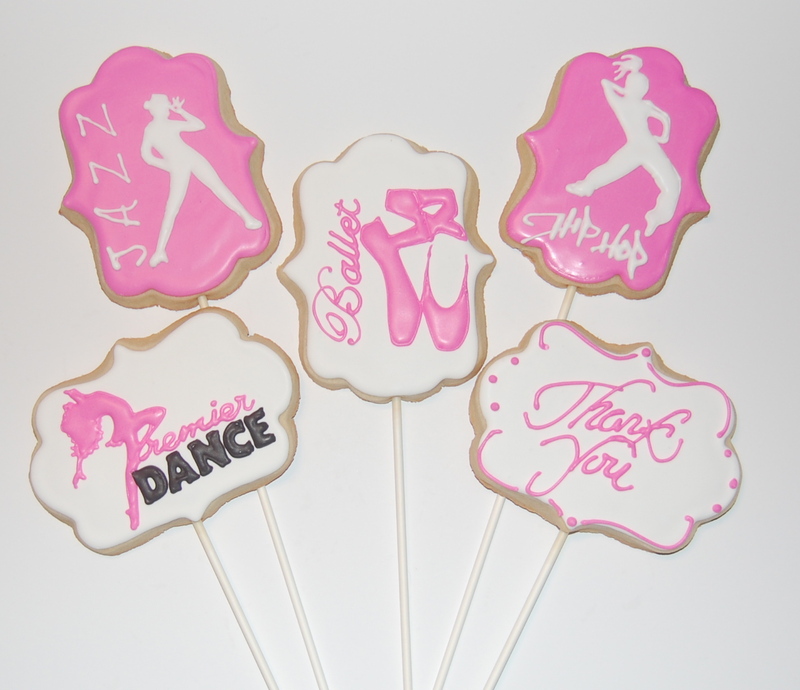 I decided to include the dance studio’s logo on one of the sugar cookies. 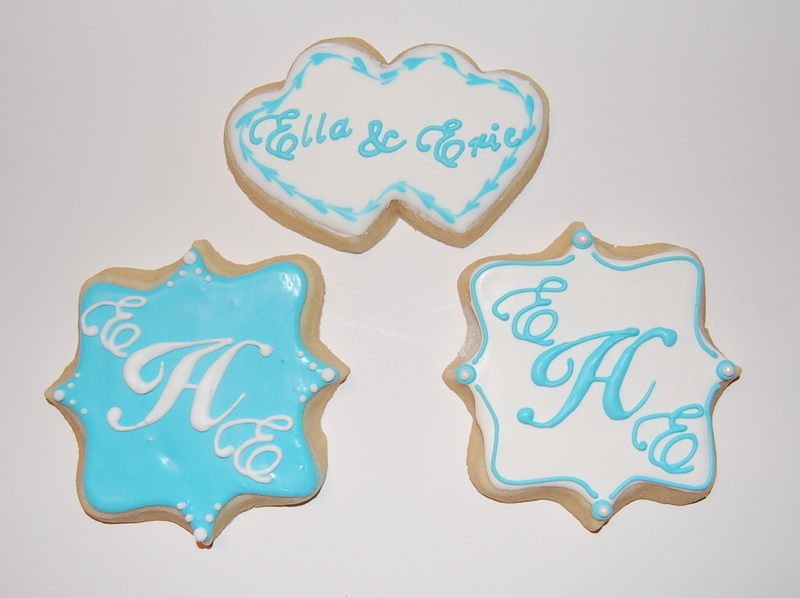 © 2014 Enchanted Cookie Boutique. All rights reserved.